Download Card offer subject to expiration. 180-gram double vinyl LP plus CD! 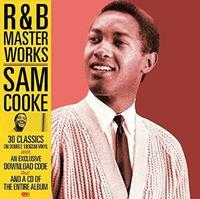 Sam Cooke, generally considered among the greatest R&B performers of all time, is commonly known as the “King of Soul” for his distinctive vocals and importance within popular music. This Delta vinyl release features 30 classic tunes on double 180-gram vinyl LP, in a gatefold jacket containing a CD of the entire album plus an exclusive download code.